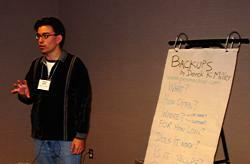 This was my second of two presentations to the Editors' Association of Canada in 2003. The other was about helping editors build websites, and took place in January. You can't even touch the most most valuable part of your computer: all those megabytes of fragile, irreplaceable digital information stored inside. Your documents, client information, research notes, files, photos, music, bookmarks, and e-mail. So imagine you come home one day and your computer has been stolen. There's an electrical storm that damages it. An over-enthusiastic relative who "knows what he's doing" accidentally erases a whole bunch of your files. You drop your laptop while sprinting to catch a bus. Or your hard disk just wears out and dies after years of yeoman service. Now what? If you have a backup copy (or two or three), you'll be back on your editing feet in short order. But most people—like you?— don't have a backup, and they'll be in deep trouble. What should I use to back up? Even if you don't answer all of the questions, I hope thinking about them encourages you to make some copies of your essential files, because the originals may be impossible to replace if anything drastic (or even mundane) happens. Both are MP3 audio files, so your computer needs to be able to play MP3s. Try QuickTime (Windows and Mac—free! ), iTunes (Mac and Windows—yes, free! ), or WinAmp (Windows—oy, free!). I originally posted these links on my home page journal on 20 November 2003. 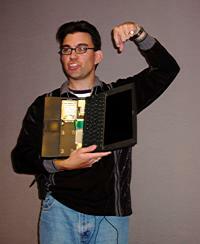 My article from three years ago about my own nasty "no backup" experiences in 1988 and 1996. The Tao of Backup, the most concise (and funniest) description of what a full backup strategy should encompass. The Beginner's Guide to Disaster Prevention. 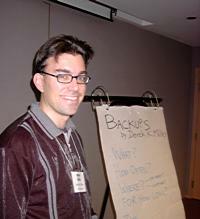 About.com's series on basic backups from 1999: part 1, part 2, and part 3. The cheap ($10 USD) Ten Quick Steps to Perfect Backups e-book. A short page about backup strategies. The excellent 1998 article series, Have You Backed Up Today?, from the excellent online magazine TidBITS, to which I'm an occasional contributor (but not about backups). Macintosh Backup Strategies, which refers to the TidBITS series and talks about a few more things too. The Open Directory's listing of backup software. Apple Backup for the .Mac subscription service. Backup—Or Else!, a guide from Geek Girls to using the Backup software built into Windows. Dantz Retrospect Desktop for Mac and Retrospect Professional for Windows, including a list of supported devices. Roxio Toast and Easy CD Creator for burning CDs, including a list of supported CD writers. Maxtor's OneTouch one-button backup external hard disks. A very detailed page from John Faughnan on backing up a mixed Mac-Windows network using Retrospect software.